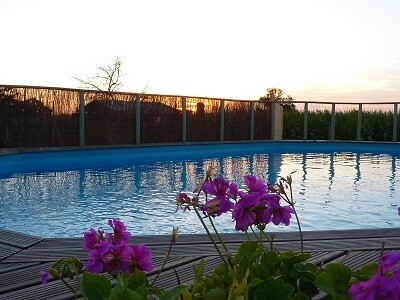 If you are looking for family friendly holiday accommodation in the Pays de la Loire or Charente Maritime region of France look no further, Our Cottages vary from 1 to 8 bedrooms, plus holiday complexes, and in combinations can cater for really large groups. Set in Rural tranquil surroundings allowing you to unwind in a truly relaxing atmosphere, yet both on site and nearby are all the activities needed to keep you and the kids entertained in as safe an environment as is possible. La Croix Liaud is a beautiful16th century farmhouse set on the edge of the village of Cezais, in the sunny south Vendee. This lovingly restored property comprises of a large 5 bedroom house which sleeps 12 comfortably (it can also be split into 2 separate gites, one of which has 2 bedrooms and the other has 3 bedrooms, offering more privacy), La Puit a Souhaits is the 2 bedroomed gite. 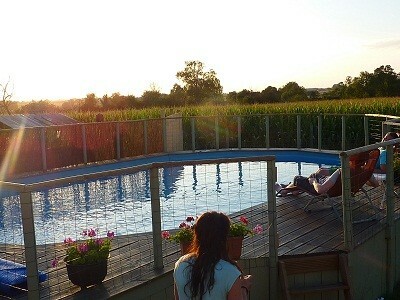 The gites can be let either together, which is ideal for larger groups, or independently. This is very versatile accommodation which can be let to suit the size of your group. Every guest has a high quality bed and mattress in a dedicated bedroom, not on sofa beds in lounges etc. Enjoy the wonderful swimming pool - 6 metres x 11 metres and 1.2 metres deep- very popular with the children and adults alike! The swimming pool is fenced off for security. A selection of patios and quiet areas, something for everyone...whether you want a quiet corner to sit and read a book whilst enjoying a glass of wine, or a larger communal patio ideal for get togethers and barbeques. 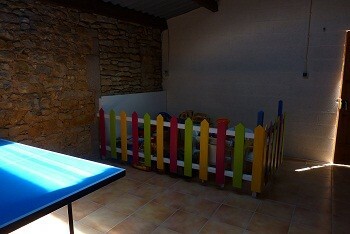 All this is set in a walled and fenced garden of just over half an acre with a child friendly courtyard, and new for 2011 a dedicated games room housing table tennis, pool table and table football plus an indoor play area and seating. The 6 metres x 11 metres (and 1.2 metres deep) swimming pool is set within a large grass playing area with basketball net and children's play area. A toilet with baby changing table is available adjacent to the swimming pool. The garden is also a lovely place to sit in the evening to watch the beautiful Vendeen sunsets, and then the millions of stars in the late evening sky. The stone built summer house is set within the courtyard and is equipped with satellite TV, and comfortable seating. A terraced area also within the courtyard has a barbeque, tables with sunshades to shade you from the Vendeen sun. There are many nooks and crannies to sit and relax in the garden area's or shelter from the sun within the covered pressoire area. Pass through the pressoire into the front garden of La Croix Liaud to the working well area where you can enjoy a game of boules, or just sit at one of the tables in the enclosed garden complete with a charcoal BBQ and relax with a glass of wine after a day exploring the Vendee. 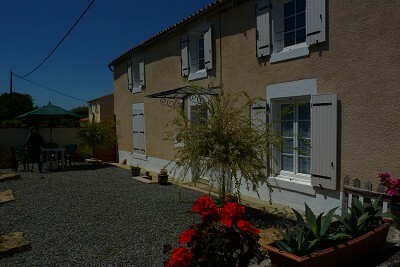 Gite "La Puit a Souhaits" - 2 Bedrooms which sleep up to 5, named after the wishing well at the front of the property. 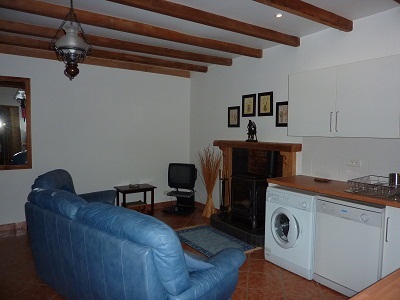 The gite has lots of traditional features and offers an open plan kitchen/diner/lounge. 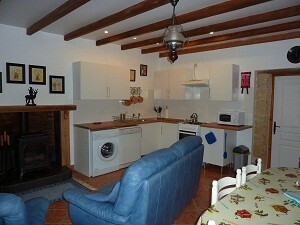 The kitchen area includes oven/hob, fridge freezer, dishwasher, microwave and a washing machine. Large dining table and chairs and comfortable seating in the living area. Woodburner fire. 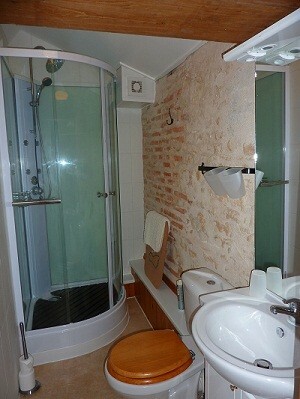 Upstairs you will find a double bedroom with ensuite WC and washbasin. The second bedroom consists of Double bed and single bed. An outdoor WC with washbasin and baby changing area in pool/garden area. 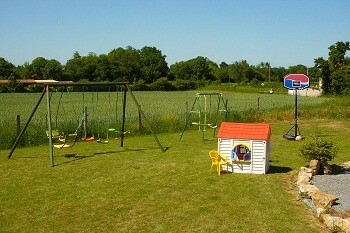 The terrace has a play house to keep the little one's engaged whilst mum or dad cook on the BBQ. mum and dad to enjoy the many facilities within. Swings for children under 12 and a slide for small children. Optional Extras - Hire of bed linen £10 per single bed per week. need to bring pool/beach towels with you. Security deposit will be £250 - fully refundable if no damage to property and left in a clean and tidy condition. La Croix Liaud is located in a quiet rural location on the outskirts of Cezais, yet only 5 minutes from the village of Vouvant (one of the prettiest villages in France) where you will find, boulangerie, cafe/bar, restaurant etc. They have a "bread lady" visit the property twice a week to deliver a choice of breads to the door. 10 minutes from Mervent which is fantastic for walks, cycling, fishing, lovely picnic areas, it even has a zoo and Pierre Brun play/activity park. The nearest town of La Chataignerie is approx 10 minutes drive and the Rennaissance town of Fonteney le Comte with lots of lovely cafes,restaurants, shops, hypermarkets etc approx 20 minutes drive. Trout fishing lake just 5 minutes away - you will need a permit, which is not difficult to get. More information on Vendee beaches, attractions, activities, lakeside beaches, fishing etc can be found at the top of this page in the links box to the left. Travel from ferry ports - St Malo - 3.5 hours, Caen - 4.5 hours, Calais - 6 hours drive. La Croix Liaud offers lots of great outdoor space with a selection of open communal areas as well as quiet nooks and crannies to sit quietly with a glass of wine and read a book!